From an early age, I was always intrigued by the subject of anthropology, the study of human origins. It is only natural that I see anthropology from a genealogist's perspective. The recent development of DNA testing as a genealogy tool has served to blur the lines between the two subjects. My take on it is that anthropology is genealogy, but just on much grander scale. Genealogists tend to focus on the latest 6 generations of the family line while anthropology deals with thousands of generations deep in the family tree. 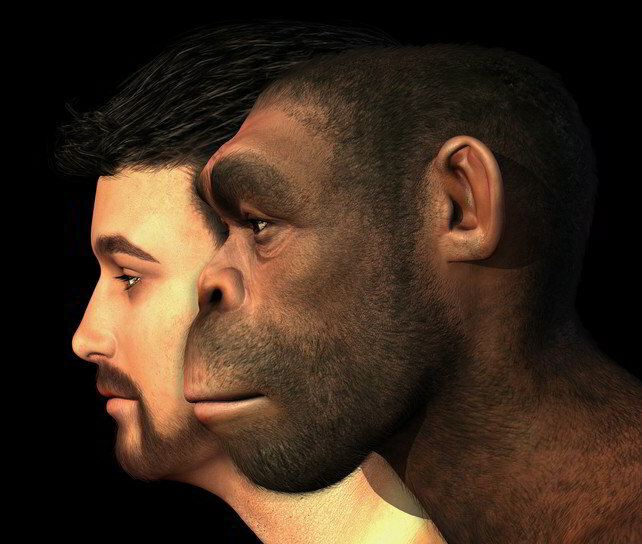 It is amazing to think of two human species walking the planet at the same time, but that is exactly what happened with modern humans and Neanderthals. About 50,000 years ago, modern day humans migrated out of Africa north to Europe and East Asia and met up with Neanderthals that had been living in the colder climates for more than 100,000 years. Some of the two species mated and passed on their genes to their children. Eventually, the Neanderthals died off as a species, but left traces of their Neanderthal DNA inside the DNA of modern humans. At first, scientists theorized that the two human species shared no DNA, but recent studies reveal that there was indeed relationships between these early humans. DNA analysis indicates the genes that help determine most people's skin, hair and certain immune system functions are more Neanderthal than not. The studies looked at the DNA of fossils hidden in the modern human genome. One theory is that the Neanderthal DNA probably helped the darker humans out of Africa cope with the cooler less bright north. Living in the cooler Europe means less ultraviolet light and less vitamin D from the sun. According to the popular personal genomics company 23andMe, most people have Neanderthal DNA, on average about 2.5 percent. They have now developed a DNA test, using a donor saliva sample, to measure the percentage of DNA that comes from the Neanderthal branch of your family. If you have a need to get in touch with your inner caveman, there is now a way to test your DNA to see how much of a Neanderthal you really are. As the fossil record of early humans continues to expand in the search for the animal to human missing link, scientists are coming to terms with the fact that the family tree of modern humans is much more complex and convoluted than previously thought. If you think in terms of Darwinian theory, it only makes sense that there were a lot of branches on the familial tree, many of which died out. Some dead branches, like Neanderthals, left their mark in our DNA record.